Thomas Jefferson was born on 13 April, 1743 and died on 4 July, 1826, the 50th anniversary of the adoption of the Declaration of Independence. Thomas Jefferson died a few hours before the death of John Adams, his compatriot in their quest for independence, then great political rival, and later friend and correspondent. John Adams is often rumoured to have referenced Thomas Jefferson in his last words, unaware of his passing. Thomas Jefferson was the 3rd President of the United States (1801–1809), the principal author of the Declaration of Independence (1776), and one of the most influential Founding Fathers for his promotion of the ideals of republicanism in the United States. Major events during his presidency include the Louisiana Purchase (1803) and the Lewis and Clark Expedition (1804–1806). As a political philosopher, Thomas Jefferson was a man of the Enlightenment and knew many intellectual leaders in Britain and France. 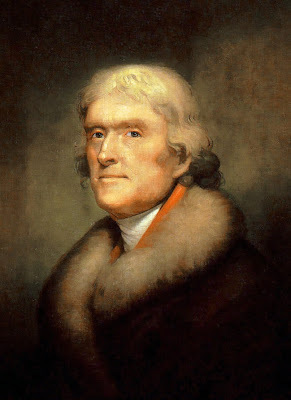 Thomas Jefferson idealised the independent yeoman farmer as exemplar of republican virtues, distrusted cities and financiers, and favoured states’ rights and a strictly limited federal government. Thomas Jefferson supported the separation of church and state and was the author of the Virginia Statute for Religious Freedom (1779, 1786). Thomas Jefferson was the eponym of Jeffersonian democracy and the co-founder and leader of the Democratic-Republican Party, which dominated American politics for a 1/4 century. Thomas Jefferson served as the wartime Governor of Virginia (1779–1781), 1st United States Secretary of State (1789–1793) and 2nd Vice President (1797–1801). A polymath, Thomas Jefferson achieved distinction as, among other things, a horticulturist, statesman, architect, archaeologist, paleontologist, author, inventor, and founder of the University of Virginia. When President John F. Kennedy welcomed 49 Nobel Prize winners to the White House in 1962 he said, “I think this is the most extraordinary collection of talent and of human knowledge that has ever been gathered together at the White House – with the possible exception of when Thomas Jefferson dined alone.” Thomas Jefferson has been consistently ranked by scholars as one of the greatest U.S. Presidents. Thomas Jefferson was born into a family closely related to some of the most prominent individuals in Virginia, the 3rd of 8 children. Thomas Jefferson’s mother was Jane Randolph, daughter of Isham Randolph, a ship’s captain and sometime planter, and first cousin to Peyton Randolph. Thomas Jefferson’s father was Peter Jefferson, a planter and surveyor in Albemarle County (Shadwell, then Edge Hill, Virginia.) Thomas Jefferson was of Welsh descent. When Colonel William Randolph, an old friend of Peter Jefferson, died in 1745, Peter Jefferson assumed executorship and personal charge of William Randolph’s estate in Tuckahoe as well as his infant son, Thomas Mann Randolph. That same year the Jeffersons relocated to Tuckahoe where they would remain for the next 7 years before returning to their home in Albemarle whereupon Peter Jefferson was appointed to the Colonelcy of the county, a very important position at the time. In 1752, Thomas Jefferson began attending a local school run by William Douglas, a Scottish minister. At the age of 9, Thomas Jefferson began studying Latin, Greek, and French. In 1757, when he was 14 years old, his father died. Thomas Jefferson inherited about 5,000 acres (20 km²) of land and dozens of slaves. Thomas Jefferson built his home there, which eventually became known as Monticello. After his father’s death, he was taught at the school of the learned minister James Maury from 1758 to 1760. The school was in Fredericksville Parish near Gordonsville, Virginia, 12 miles (19 km) from Shadwell, and Thomas Jefferson boarded with James Maury’s family. There he received a classical education and studied history and science. While in college, Thomas Jefferson was a member of a secret organisation called the Flat Hat Club, now the namesake of the William & Amp; Mary student newspaper. Thomas Jefferson lodged and boarded at the College in the building known today as the Sir Christopher Wren Building, attending communal meals in the Great Hall, and morning and evening prayers in the Wren Chapel. Thomas Jefferson often attended the lavish parties of royal governor Francis Fauquier, where he played his violin and developed an early love for wines. After graduating in 1762 with highest honours, he studied law with George Wythe and was admitted to the Virginia bar in 1767. In addition to practicing law, Thomas Jefferson also represented Albemarle County in the Virginia House of Burgesses beginning in 1769. Following the passage of the Coercive Acts by the British Parliament in 1774, he wrote a set of resolutions against the acts, which were expanded into A Summary View of the Rights of British America, his 1st published work. Previous criticism of the Coercive Acts had focused on legal and constitutional issues, but Thomas Jefferson offered the radical notion that the colonists had the natural right to govern themselves. Thomas Jefferson also argued that Parliament was the legislature of Great Britain only, and had no legislative authority in the colonies. The paper was intended to serve as instructions for the Virginia delegation of the 1st Continental Congress, but Thomas Jefferson’s ideas proved to be too radical for that body. Nevertheless, the pamphlet helped provide the theoretical framework for American independence, and marked Thomas Jefferson as one of the most thoughtful patriot spokesmen. Thomas Jefferson served as governor of Virginia from 1779–1781. As governor, he oversaw the transfer of the state capital from Williamsburg to the more central location of Richmond in 1780. Thomas Jefferson continued to advocate educational reforms at the College of William and Mary, including the nation’s 1st student-policed honour code. In 1779, at Thomas Jefferson’s behest, William and Mary appointed George Wythe to be the 1st professor of law in an American university. Dissatisfied with the rate of changes he wanted to push through, he later became the founder of the University of Virginia, which was the 1st university in the United States at which higher education was completely separate from religious doctrine. Virginia was invaded twice by the British during Thomas Jefferson’s term as governor. Thomas Jefferson, along with Patrick Henry and other leaders of Virginia, were but 10 minutes away from being captured by Banastre Tarleton, a British colonel leading a cavalry column that was raiding the area in June 1781. Public disapproval of his performance delayed his future political prospects, and he was never again elected to office in Virginia. After returning from France, Thomas Jefferson served as the 1st Secretary of State under George Washington (1789–1793). Thomas Jefferson and Alexander Hamilton began sparring over national fiscal policy, especially the funding of the debts of the war, with Alexander Hamilton believing that the debts should be equally shared, and Thomas Jefferson believing that each state should be responsible for its own debt (Virginia had not accumulated much debt during the Revolution). In further sparring with the Federalists, Thomas Jefferson came to equate Alexander Hamilton and the rest of the Federalists with Tories and monarchists who threatened to undermine republicanism. Thomas Jefferson equated Federalism with “Royalism,” and made a point to state that “Hamiltonians were panting after…and itching for crowns, coronets and mitres.” Thomas Jefferson and James Madison founded and led the Democratic-Republican Party. Thomas Jefferson worked with James Madison and his campaign manager John J. Beckley to build a nationwide network of Republican allies to combat Federalists across the country. Thomas Jefferson at the end of 1793 retired to Monticello where he continued to orchestrate opposition to Alexander Hamilton and George Washington. However, the Jay Treaty of 1794, orchestrated by Alexander Hamilton, brought peace and trade with Britain – while James Madison, with strong support from Thomas Jefferson, wanted, Miller says, “to strangle the former mother country” without actually going to war. “It became an article of faith among Republicans that ‘commercial weapons’ would suffice to bring Great Britain to any terms the United States chose to dictate.” Thomas Jefferson, in retirement, strongly encouraged James Madison. As the Democratic-Republican candidate in 1796 he lost to John Adams, but had enough electoral votes to become Vice President (1797–1801). Thomas Jefferson’s arliamentary procedure, but otherwise avoided the Senate. Working closely with Aaron Burr of New York, Thomas Jefferson rallied his party, attacking the new taxes especially, and ran for the Presidency in 1800. Consistent with the traditions of the times, he did not formally campaign for the position. Prior to the passage of the 12th Amendment, a problem with the new union’s electoral system arose. Thomas Jefferson tied with Aaron Burr for 1st place in the Electoral College, leaving the House of Representatives (where the Federalists still had some power) to decide the election. After lengthy debate within the Federalist-controlled House, Alexander Hamilton convinced his party that Thomas Jefferson would be a lesser political evil than Aaron Burr and that such scandal within the electoral process would undermine the still-young regime. The issue was resolved by the House, on 17 February, 1801 after 36 ballots, when Thomas Jefferson was elected President and Aaron Burr Vice President. Aaron Burr’s refusal to remove himself from consideration created ill will with Thomas Jefferson, who dropped Aaron Burr from the ticket in 1804 after Aaron Burr killed Alexander Hamilton in a duel. After leaving the Presidency, Thomas Jefferson continued to be active in public affairs. Thomas Jefferson also became increasingly concerned with founding a new institution of higher learning, specifically one free of church influences where students could specialise in many new areas not offered at other universities. Thomas Jefferson believed educating people was a good way to establish an organised society, and also felt schools should be paid for by the general public, so less wealthy people could obtain student membership as well. A letter to Joseph Priestley, in January, 1800, indicated that he had been planning the University for decades before its establishment. Thomas Jefferson’s dream was realised in 1819 with the founding of the University of Virginia. Upon its opening in 1825, it was then the 1st university to offer a full slate of elective courses to its students. One of the largest construction projects to that time in North America, it was notable for being centered about a library rather than a church. In fact, no campus chapel was included in his original plans. Until his death, Thomas Jefferson invited students and faculty of the school to his home; Edgar Allan Poe was among those students. Thomas Jefferson is widely recognised for his architectural planning of the University of Virginia grounds, an innovative design that is a powerful representation of his aspirations for both state sponsored education and an agrarian democracy in the new Republic. Thomas Jefferson’s educational idea of creating specialised units of learning is physically expressed in the configuration of his campus plan, which he called the “Academical Village.” Individual academic units are expressed visually as distinct structures, represented by Pavilions, facing a grassy quadrangle, with each Pavilion housing classroom, faculty office, and residences. Though unique, each is visually equal in importance, and they are linked together with a series of open air arcades that are the front facades of student accommodations. Gardens and vegetable plots are placed behind surrounded by serpentine walls, affirming the importance of the agrarian lifestyle. Thomas Jefferson’s highly ordered site plan establishes an ensemble of buildings surrounding a central rectangular quadrangle, named The Lawn, which is lined on either side with the academic teaching units and their linking arcades. The quad is enclosed at one end with the library, the repository of knowledge, at the head of the table. The remaining side opposite the library remained open-ended for future growth. The lawn rises gradually as a series of stepped terraces, each a few feet higher than the last, rising up to the library set in the most prominent position at the top, while also suggesting that the Academical Village facilitates easier movement to the future. Stylistically, Thomas Jefferson was a proponent of the Greek and Roman styles, which he believed to be most representative of American democracy by historical association. Each academic unit is designed with a 2 story temple front facing the quadrangle, while the library is modeled on the Roman Pantheon. The ensemble of buildings surrounding the quad is an unmistakable architectural statement of the importance of secular public education, while the exclusion of religious structures reinforces the principal of separation of church and state. The campus planning and architectural treatment remains today as a paradigm of the ordering of manmade structures to express intellectual ideas and aspirations. A survey of members of the American Institute of Architects identified Thomas Jefferson’s campus as the most significant work of architecture in America. Although he was born into one of the wealthiest families in the United States, Thomas Jefferson was deeply in debt when he died. Thomas Jefferson’s trouble began when his father-in-law died, and he and his brothers-in-law quickly divided the estate before its debts were settled. It made each of them liable for the whole amount due – which turned out to be more than they expected. Thomas Jefferson sold land before the American Revolution to pay off the debts, but by the time he received payment, the paper money was worthless amid the skyrocketing inflation of the war years. Cornwallis ravaged Thomas Jefferson’s plantation during the war, and British creditors resumed their collection efforts when the conflict ended. Thomas Jefferson was burned again when he co-signed notes for a relative who reneged on debts in the financial panic of 1819. Only Thomas Jefferson’s public stature prevented creditors from seizing Monticello and selling it out from under him during his lifetime. Thomas Jefferson has been described by many people as a thin, tall man, who stood at approximately 6 feet and remarkably straight. “The Sage of Monticello” cultivated an image that earned him the other nickname, “Man of the People.” Thomas Jefferson affected a popular air by greeting White House guests in homespun attire like a robe and slippers. Dolley Madison, wife of James Madison (Thomas Jefferson’s secretary of state), and Thomas Jefferson’s daughters relaxed White House protocol and turned formal state dinners into more casual and entertaining social events. Although a foremost defender of a free press, Thomas Jefferson at times sparred with partisan newspapers and appealed to the people. Thomas Jefferson’s writings were utilitarian and evidenced great intellect, and he had an affinity for languages. Thomas Jefferson learned Gaelic in order to translate Ossian, and sent to James Macpherson for the originals. As President, he discontinued the practice of delivering the State of the Union Address in person, instead sending the address to Congress in writing (the practice was eventually revived by Woodrow Wilson); he gave only 2 public speeches during his Presidency. Thomas Jefferson had a lisp and preferred writing to public speaking partly because of this. Thomas Jefferson burned all of his letters between himself and his wife at her death, creating the portrait of a man who at times could be very private. Indeed, he preferred working in the privacy of his office than the public eye. Thomas Jefferson was an accomplished architect who was extremely influential in bringing the Neo-Palladian style—popular among the Whig aristocracy of Britain—to the United States. The style was associated with Enlightenment ideas of republican civic virtue and political liberty. Thomas Jefferson designed his famous home, Monticello, near Charlottesville, Virginia; it included automatic doors, the 1st swivel chair, and other convenient devices invented by Thomas Jefferson. Nearby is the only university ever to have been founded by a U.S. president, the University of Virginia, of which the original curriculum and architecture Thomas Jefferson designed. Today, Monticello and the University of Virginia are together 1 of only 4 man-made World Heritage Sites in the United States of America. Thomas Jefferson also designed Poplar Forest, near Lynchburg, in Bedford County, Virginia, as a private retreat from a very public life. Thomas Jefferson is also credited with the architectural design of the Virginia State Capitol building, which was modeled after the Maison Carrée at Nîmes in southern France, an ancient Roman temple. Thomas Jefferson’s buildings helped initiate the ensuing American fashion for Federal architecture. Thomas Jefferson’s interests included archeology, a discipline then in its infancy. Thomas Jefferson has sometimes been called the “father of archeology” in recognition of his role in developing excavation techniques. When exploring an Indian burial mound on his Virginia estate in 1784, Thomas Jefferson avoided the common practice of simply digging downwards until something turned up. Instead, he cut a wedge out of the mound so that he could walk into it, look at the layers of occupation, and draw conclusions from them. Thomas Jefferson enjoyed his fish pond at Monticello. It was around 3 feet (1 m) deep and mortar lined. Thomas Jefferson used the pond to keep fish that were recently caught as well as to keep eels fresh. This pond has been restored and can be seen from the west side of Monticello. In 1780, he joined Benjamin Franklin’s American Philosophical Society. Thomas Jefferson served as president of the society from 1797 to 1815. Thomas Jefferson was an avid wine lover and noted gourmet. During his years in France (1784–1789) he took extensive trips through French and other European wine regions and sent the best back home. Thomas Jefferson is noted for the bold pronouncement: “We could in the United States make as great a variety of wines as are made in Europe, not exactly of the same kinds, but doubtless as good.” While there were extensive vineyards planted at Monticello, a significant portion were of the European wine grape Vitis vinifera and did not survive the many vine diseases native to the Americas. In 1801, he published A Manual of Parliamentary Practice that is still in use. In 1812 Thomas Jefferson published a 2nd edition. After the British burned Washington, D.C. and the Library of Congress in August 1814, Thomas Jefferson offered his own collection to the nation. In January 1815, Congress accepted his offer, appropriating $23,950 for his 6,487 books, and the foundation was laid for a great national library. Today, the Library of Congress’ website for federal legislative information is named THOMAS, in honour of Thomas Jefferson. Thomas Jefferson’s 2-volume 1764 edition of the Qur’an was used by Rep. Keith Ellison in 2007 for his swearing in to the House of Representatives. Though his religious views diverged widely from the orthodox Christianity of his day, throughout his life Thomas Jefferson was intensely interested in theology, spirituality, and biblical study. Thomas Jefferson’s religious commitment is probably best summarised in his own words as he proclaimed that he belonged to a sect with just 1 member. Before the Revolution, Thomas Jefferson was a vestryman in his local church, a lay position that was informally tied to political office at the time. Thomas Jefferson also had friends who were clergy, and he supported some churches financially. In 1776 Thomas Jefferson also proposed a motto for the United States Seal. Thomas Jefferson’s proposal was, “Rebellion to tyrants is Obedience to God.” Thomas Jefferson suggested that the seal should feature an image of the Biblical Hebrews being rescued by God via the Red Sea. For Thomas Jefferson, separation of church and state was a necessary reform of the religious “tyranny” whereby a religion received state endorsement, and those not of that religion were denied rights, and even punished. Following the Revolution, Thomas Jefferson played a leading role in establishing freedom of religion in Virginia. Previously the Anglican Church had tax support. As he wrote in his Notes on Virginia, a law was in effect in Virginia that “if a person brought up a Christian denies the being of a God, or the Trinity …he is punishable on the 1st offense by incapacity to hold any office …; on the 2nd by a disability to sue, to take any gift or legacy …, and by 3 year’ imprisonment.” Prospective officer-holders were required to swear that they did not believe in the central Roman Catholic doctrine of transubstantiation. Deriving from this statement, Thomas Jefferson believed that the Government’s relationship with the Church should be indifferent, religion being neither persecuted nor give any special status. During his presidency, Thomas Jefferson attended the weekly church services held in the House of Representatives. Thomas Jefferson also permitted church services in executive branch buildings throughout his administration, one author writes that this was because Thomas Jefferson “believed that religion was a prop for republican government”. From his careful study of the Bible, Thomas Jefferson concluded that Jesus never claimed to be God. Thomas Jefferson therefore regarded much of the New Testament as “so much untruth, charlatanism and imposture”. Thomas Jefferson described the “roguery of others of His disciples”, and called them a “band of dupes and impostors”, describing Paul as the “first corrupter of the doctrines of Jesus”, and wrote of “palpable interpolations and falsifications”. Thomas Jefferson also described the Book of Revelation to be “merely the ravings of a maniac, no more worthy nor capable of explanation than the incoherences of our own nightly dreams”. While living in the White House, Thomas Jefferson began to piece together his own condensed version of the Gospels, omitting the virgin birth of Jesus, miracles attributed to Jesus, divinity and the resurrection of Jesus. Thus, primarily leaving only Jesus’ moral philosophy, of which he approved. This compilation titled The LIFE AND MORALS OF JESUS OF NAZARETH Extracted Textually from the Gospels Greek, Latin, French, and English was published after his death and became known as the Jefferson Bible.